The wait is finally over. The event at Apple’s Cupertino headquarters has come to an end and we now have all the details about the iPhone 4S. Like pretty much every other Apple product announcement, the craziness is just now beginning. Pretty soon there will be hordes of people camping out in front of their local Apple stores for a week before the October 14 launch date, so eager to get their hands on the new iPhone model that they will apparently abandon their entire lives for a chance to get it first. If you’re planning on upgrading to the iPhone 4S in the near future, there are a few things you’ll need to know. We’ll tell you right now that it will be at least a month or two before you can just walk into your AT&T or Verizon (or Sprint!) store and ask for the iPhone 4S. There will be lines, pre-orders, and sell-outs to deal with before that’s even a possibility. Whether you are an iPhone-craze veteran or a naive first-timer, we’ve got all the details to help you get your hands on your shiny new iPhone 4S as soon as possible. 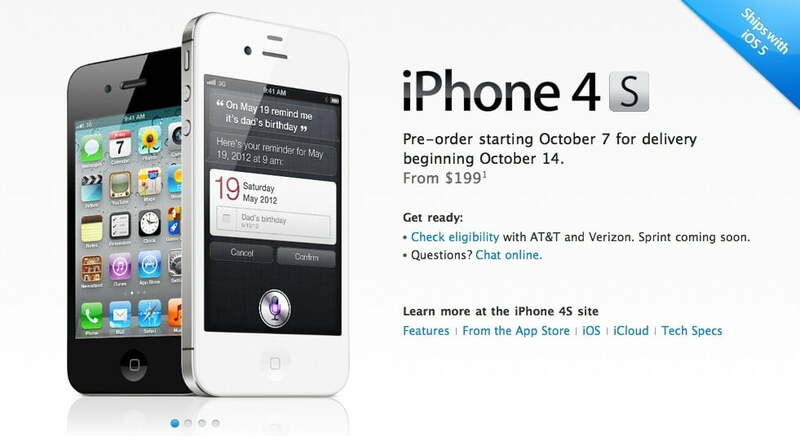 The iPhone 4S will be available for pre-order on Friday October 7, and will be launched and available for actual purchase on October 14. This launch date includes the U.S., Canada, Australia, UK, France, Germany, and Japan. The 4S will apparently be available in both black and white off the bat and the pricing with two-year contract will be $199 for the 16GB model, $299 for the 32GB model, and $399 for a new 64GB model. We don’t have any substantiated information yet on what exact time the pre-orders will begin, or what time stores will open on the 14th, but based on past history, we’re betting that the pre-orders on October 7 will start sometime between 12 AM EST and 8:30 AM EST. We’ll update this post as soon as we hear confirmed details. UPDATE: the iPhone 4S will be available in-store at your local Apple store starting at 8 AM local time on October 14. According to MacRumors, Apple representatives are telling customers that the iPhone 4S preorders will begin at 12:01 AM PST. If you’ve decided from the just-announced specs that you want to buy the iPhone 4S, you’ll have two options. The first option, which you’ll be able to do starting this Friday, is pre-order the phone. What happens when you pre-order? You should get an email soon after saying when your phone will arrive either at your doorstep or at your preferred carrier store. The idea is that if you pre-order, you’ll be able to actually get your iPhone 4S on launch day October 14 without lines or hassle. Apple has had trouble in the past keeping up with demand for preorders, so it’s unclear how quickly the pre-orders will sell out. We’d suggest being on your computer as soon as you know what time the preorders will begin, and being ready to click. If you plan to try and pick up an iPhone 4S in-store on launch day, you should probably get your camping tent ready. While demand might not be quite as high as we expected because of disappointed iPhone 5 hopefuls, the days directly before and after October 14 will be crazy. We’ll likely soon get information on when Apple stores plan to open on the 14th, and the lines will start not long after that announcement. If you want to buy the iPhone 4S in store but don’t want to deal with all the craziness, we’d suggest waiting three or four weeks for things to die down a little bit. There might still be lines at that point, but chances are you’ll be able to get in and out with your new iPhone in a reasonable amount of time. Some of the biggest news from the announcement today is that Sprint will be joining the list of iPhone carriers, including the iPhone 4S. If you take a look at the current Apple store, the iPhone 4S page allows customers to check availability and prices with both Verizon and AT&T but says “Sprint: Coming Soon.” So as of now we’re not sure if Sprint customers will be able to pre-order the iPhone 4S from the Apple Website or if they will have to wait until launch day to buy a handset in-store. Sprint users will also be able to buy the iPhone 4 in black or white for $99 with contract. Will you preorder an iPhone 4S or wait in line at a store to get your hands on it first?